Alloy Chains are the toughest, most durable slings made and are normally the preferred sling for use in steel mills, forging & casting operations, and on mobile cranes. Durability is not the only reason they are preferred, but their ability to handle elevated heat applications. The effect of elevated temperatures on the Working Load Limit of Alloy Chain Slings is available upon request, and from the alloy chain & alloy chain sling component manufacturers. Inspection of Alloy Chain Slings in important and training can be provided to better educate users on what to look for prior to use. Alloy Chain Slings are available in two grades, Grade 80 and Grade 100. Most sizes come standard in the higher Grade 100 Alloy Chain, but 1" and 1-1/4" are only available in Grade 80 Alloy Chain. There two types of alloy chain to fitting coupling methods available are Welded and Mechanically coupled. The Welded method is done by connecting a hook, fitting or master link to an unwelded coupling link, then TIG welding and heat treating the coupling link. Mechanically coupling an Alloy Chain Sling uses Coupling Links that are assembled with two half links, a single locking pin, and snap ring. The following information should be given on orders or inquiries for certified chain slings. ATTACHMENTS: Unless otherwise specified, standard master links and hooks as given herein will be used. When other than standard master links or hooks are required, we should be given a complete description or a drawing of the requested substitute. COUPLING: When selecting an alloy chain sling, you will need to choose the type of coupling you prefer. The two types are (W) welded and (M) mechanically coupled. The proper selection, application, care and inspection of chain slings used in moving material by hoisting can produce efficient and economical handling operations with minimum hazard to persons and property. Schedule periodic link-by-link inspection of chain slings, based on frequency of sling use, severity of service conditions, nature of lifts being made and experience gained on service life of slings used in similar circumstances. Clean chain prior to inspection, to make damage or defects more easily seen. Hang chain vertically, if practical, for preliminary inspection. Measure reach accurately (bearing point of master link to bearing point of hook). Check this length against reach shown on tag. Inspect link by link, where the following should be looked for: a. Bent, gouged, nicked, worn or elongated links. b. Cracks, scoring or marking tending to weaken links. Transverse markings are the most dangerous. c. Severe corrosion. d. Excessive wear – Slings with links having wear should be removed from service. 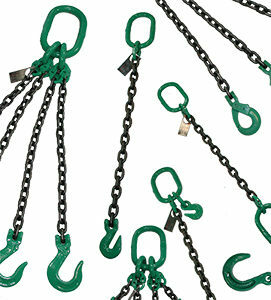 Check master links and hooks for all of the above faults – hooks especially for excessive throat opening. It is strongly recommended that chain slings showing faults by the above inspection method be immediately removed from service and returned to manufacturer for repair. Delta Rigging and Tools offers chain sling inspection service performed by our own qualified inspectors. Call today to schedule an inspection of your slings.